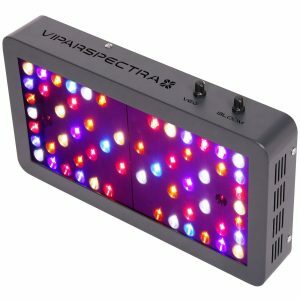 The VIPARSPECTRA V300 has been top choice among grow lights in terms of sales for quite a while, so we decided to write this review to learn why it is so popular. As you know, we’re always the first to recommend a good product when we see or hear of one. The VIPARSPECTRA Reflector Series V300 LED Grow Light is scientifically designed to strike the right balance between coverage and PAR/Lumen Output. PAR is a measurement of the intensity and coverage of the light. This product is very popular because of its optimal full spectrum, which provides plants in all stages of growth with an environment that is just like their natural one, especially in terms of natural light. In this case, the light panels offer light that is even more conducive to fast, healthy growth than sunlight. This grow light offers traditional 250 watts HPS/MH performance, but consumes half of that power. Its maximum coverage is 3×3’. It’s ideal for a 2×2′ grow area at 24″ height. This light is perfect for beginning growers who are starting small. The basic LED light panel penetrates the plant canopy and covers 2 feet by 2 feet for optimal growth. It features a mix of 5-watt LEDs that put out a complete light spectrum, from UV to IR. The far ends of the spectrum are not visible to the naked eye, which is why you can’t tell the LEDs are on. Warning – it follows from this that it is not safe to look at the panel when it’s turned on. Make sure you wear protective eyewear so you can inspect your plants without needing a different light or turning off your panel. This light features reflector design and upgraded aluminum cooling heat sinks, thanks to which it runs much cooler than HID lights. It has been fine-tuned by indoor growers over many years of careful tests and experiments. With this light, you will enjoy a bigger yield and better quality with big, dense and resin-coated flowers. The design is not focused on the middle of the growing area, thereby avoiding plant burn and stunted plant growth. The big aluminum cooling heat sinks (0.8″ height) and upgraded 4.72″ fans enable heat dissipation. The manufacturer offers a 3-year warranty plus 30 days satisfaction or return guarantee. The item is shipped with 1 reflector of 300W, one hanging kits, one six-foot power cord (UK Standard 220V grounded 3 prong plug), and a timer to control it (if you want). The light can only be used indoors, because it is not waterproof. You don’t need any extra ballast. The spectrum of this LED lights includes IR, 440nm, 445nm, 460nm, 475nm, 580nm, 595nm, 615nm, 630nm, 660nm, 3000K, and 7500K. This is why it is ideal for every stage of plant growth. You can connect two or more lights using the power cord that comes with the item, which is of course available on Amazon. The maximum connection is 1000W actual power consumption. This needs to be complied with for safety reasons. Optimally, you can put 4 plants under this light depending on their size. The LED panels are a great choice for growing plants indoors because they use less electricity and cast a lot of light. You don’t need extra fans to cool your grow box or cabinet because they generate less heat. This means you save money on electricity and do not attract any unwanted attention. This light is great value for money. Your plants will grow rapidly, much faster than they would outdoors in natural sunlight. You can leave the light on for over 12 hours. You don’t need ballast because LED light output does not flicker, unlike other types (HID/HPS) that generate lots of heat and use a lot of electric power. This light utilizes 5-watt LED bulbs manufactured by well-known, reputable companies like Bridgelux and Epileds. The LEDs point straight down at the plants, set up at a 90-degree angle. They last a minimum of 50,000 hours before burning out, equivalent to about 6 years. You are more likely to upgrade this light before needing a new one. This light is excellent value for money, best suited for growers just starting out, who want to grow a maximum of 5 plants and don’t have a vast grow space available. It is one of the most popular lights on the market, and there is good reason for that, as you can see!